This is so cute and inspiring! I'm working an a organization overhaul in my place right now - thanks for the great ideas. 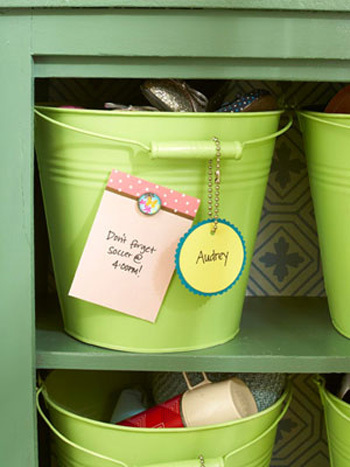 I like the storage bucket idea - have a few of those. Now I know actually what to do with it...thanks. 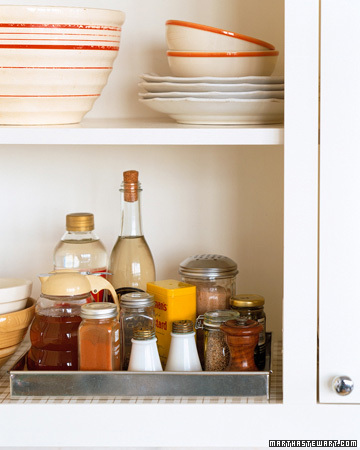 Love these storage ideas, I'm always looking for new ways to organize items in my tiny apartment. 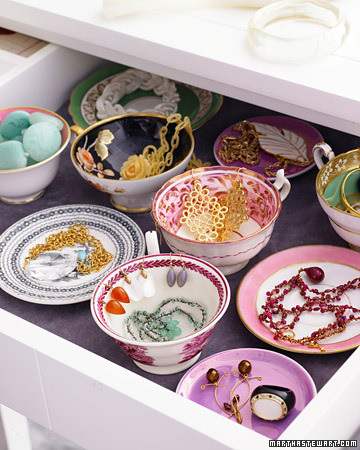 I particularly like the pretty bowls and plates used for jewelry storage. Thanks for sharing! Well you have given me a lot to do!..But it will be worth it! Thanks for sharing! 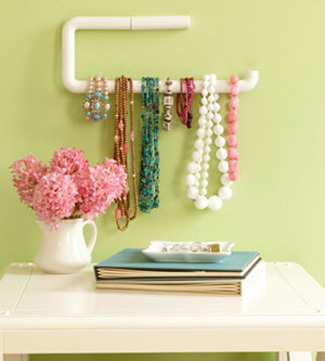 so many great ideas...loving the tip for hooks under the sink!! The paper towel holder is brillant! I hate it when my necklaces are in a tangled mess. The ice cube tray is awesome, too. I saw someone else do this with a ceramic egg crate dish. Fun! I loved the tips, especially the hint 4 and 5! 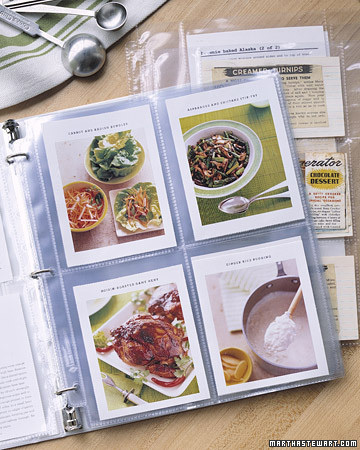 Nothing better than a good organization to get everything with a twist. 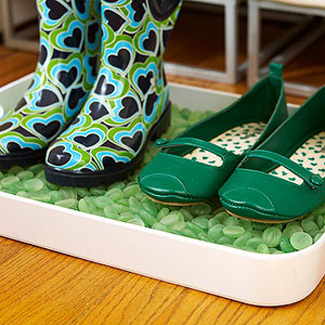 That seaglass stone idea for shoes is pure Genius! What a great post! I'm already doing some of these but will definitely try others! Great ideas! 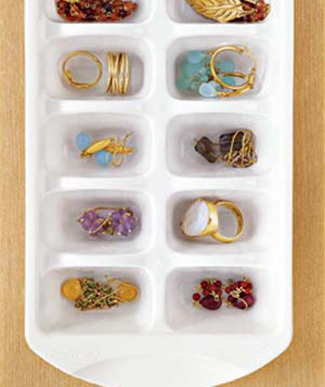 I will definitely have to try out the ice cube tray one. Anthropologie carries cute egg crates that might work well too! 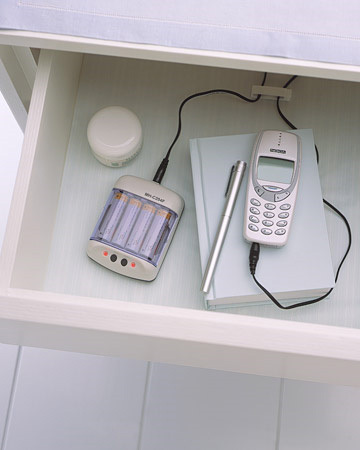 Putting a pair of earrings through the holes of a button keeps them organized very well! Love love love the china idea, too! These are such fantastic ideas!!! Thanks for sharing them, I especially loved the first one. I'm in need of a new arrangement for my necklaces and bracelets! This is so inspiring, thanks for sharing! I'll definitely be trying some of these out. I love all of these ideas, esp the teacup and saucer jewelry organizing and the baking pans to corral kitchen stuff. Shared this on my Speckled Dog FB page. I love these so much, thank you for the inspiration! Gorgeous photos too. 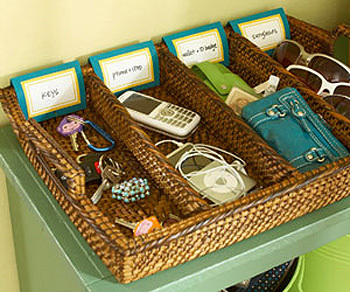 Nice... That's the best way to organized home. your idea are classics but still the displays are always fabulous. I might as well apply this to my neighbors jewelry display store just across the lot - she might actually like this idea...toilet holder turned into fabulous jewelry displays.